The rescheduled National Paddle Day took place, with a few extra activities added on 22nd Oct, beautiful weather and a good roll up of Club members. The Dotting of the Eyes was followed by the Blessing of the Boats conducted by Father Frank Hetherington. Deb Clarke from Pan Dragons and Neil Stephens and daughter Carmen from Forbes joined us for the morning. Having joined us for a paddle in one of the boats, Andrew Gee declared great respect for paddlers–he was bit puffed by this time–but we can expect to see him in the boat ‘when parliamentary duties permit’. Phil Lambert was kept busy helping three trainee sweeps from three clubs improve their skills. Thank you to all those who helped in any way, just to have members there is so encouraging for the committee. We have had messages of thanks from our trainee sweeps, from members who found the whole ceremony a moving experience and from all those who enjoyed the fellowship and the barbeque. Dragons Abreast Orange – Six members plus 3 supporters participated in the DAA Festival at Darling Harbour in the team Just Do It. Gail and her daughter Lisa were the motivators behind the Fabulous Fitness Team. Each team raised over $2000 exceeding their targets. Overall the Regatta, one of only two annual major fundraisers for DAA has to date raised over $187,000. Apart from the fundraising it was great weekend, rules that usually apply sort of got lost along the way. 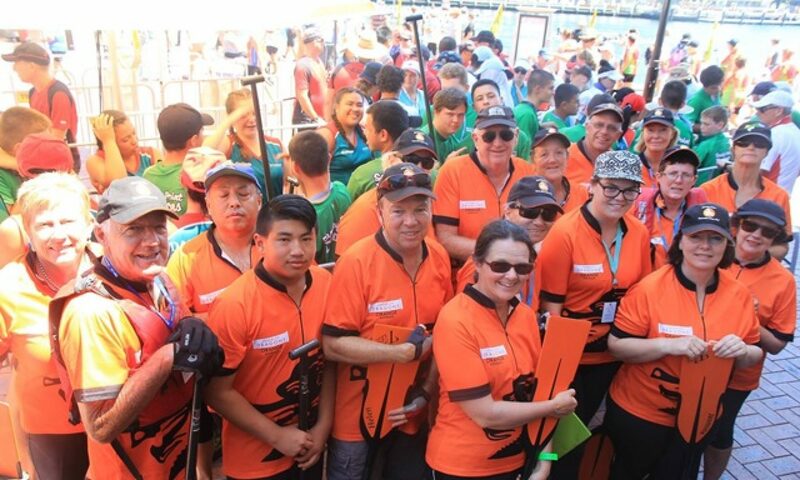 Both the local teams were supplemented with paddlers from DASydney, several of whom have been in Australian representative teams at the World Championships – which just might have influenced both teams gaining 4th, 2nd and 3rd placing in different categories. It was great to have new DA supporter Pam with us for first time. And giving us a warm fuzzy feeling –so many people telling us how much they are looking forward to coming to Orange for the regatta. One Sydney paddler is disgusted with her niece who has been inconsiderate enough to arrange her wedding for that weekend!! Kamini Jain Paddling Clinic – general consensus – excellent. Burrendong Sport and Rec Centre is ideal for such a training session. Paddlers from four western region clubs, ACT and Victoria worked hard, laughed a lot and fell asleep very fast at night. Nine hours on the water over two days ensured lessons learnt, stuck. We were all quite happy when there was a break in the training while Kamini and co coach Leanne admired the wedgetail soaring overhead and we were all rapt watching as three emus came down to the water for a bath! There was plenty of socializing in the evenings. Couldn’t help but be amazed how the wine and beer ‘appeared’ from nowhere when the barbeque was fired up and have you any idea how noisy a game of “Who Said That” can be when 3 young people are asking the questions. Rather belated but: Pam Johnson’s hockey team had an excellent result at the National Championships, Elise Jones gained the hockey coaches award. Several of our younger members have completed or almost completed HSC exams – hope it hasn’t been too bad for the parents of Alex, Hayden and Taylor! Training – Increasing paddlers fronting up all sessions. Thursday’s sessions are becoming more and more intense as those who attended last Thursday will tell you. Don’t forget Tuesday and Saturday training allows more time to be spent on technique improvement while Thursday is about building up stamina and speed. Its not fair on anyone, or safe for new paddlers to be expected to train almost non stop for an hour of hard training. Squad training – continues. Members of four regional clubs attending, they are rising to the challenge extremely well and this is reflected in Club training performance We are moving into training for State representative level. If a Club member, even relatively new paddler is interested in joining the squad please see me, no promises but it may be possible. The same conditions will apply ie Club training at least once a week, attend 2 out of every 3 Squad training sessions, regardless of where they take place and expect those sessions to be at least 1 ½ hours on the water – non stop. Regatta – entries are trickling in, good to see ‘new’ teams entering. If you are involved with getting a community team together don’t forget deadline for entries is THURSDAY 03rd, that’s days away. If you are paddling with the CCDB Club team, entry fees to Yvonne (or in the envelopes at training) should have been paid by last Friday and don’t forget your membership needs to be up to date.